Making life blissful one moment at a time. I have had this done for months now and haven't had it decorated the way I would like so I haven't posted my finished product but I guess this will have to do. So here's what I started with. You can see that I changed the hardware to an aged silver. 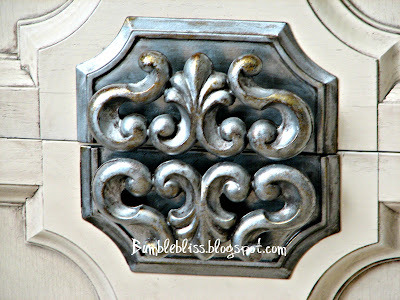 I used Rustoleum's heirloom white, a dark-tinted glaze from Valspar, and Rub n' Buff's silver leaf wax. This piece took longer than it needed to just because of me taking my time. I went to the store and found a great deal on some canned pumpkin. Pumpkin is great for you and with a little tweaking is great to eat in so many dishes. I was excited so I bought two. Imagine my surprise when I noticed that I really bought Pumpkin Pie Mix. It already has the sugar and spices mixed right in. Not quite what I was looking for. I did the only thing I could think to do and searched for a recipe to use this in. I found a great site full of fun things. . Carrots n Cake is the site I landed on and THIS is the recipe I followed. I am looking forward to diving deeper in this site and finding other gems to try. 375 degrees for 18-20 min. Changes I made. I used olive oil instead of canola oil since I had that. I used pumpkin pie mix that has added sugar. I used 1/2 C chocolate chips instead of the rasins and nuts because thats what I had and it just sounded good. I also made 12 muffins instead of 9. We each ate one then put the rest in the freezer in sandwich bags tied off to keep the air out. I put one in the Hubbs lunch each morning for a week and he loved them. By lunch time they were soft enough to eat but still cool enough to be a nice summer treat. This is a recipe we will make again and again. I do still love my bobble bottle but the filters are not for as easy to find in the store anymore. Had I known this Id have a closet full. I am always on the lookout for a deal and I found a code for 25% off so I jumped on it. FREE WATER is the code. Im not sure how long its good for so test it before you hit send. It worked for me today. Water Bobble Website order here. Walmart is a great place to get free samples. They never need a credit card and ask just enough questions. Often the samples come with a coupon to add to the savings. I have found a few products I love just by trying them for free the first time. We also take the samples with us on trips. Why buy travel sized when you gan get them for free? If you try to get this and samples are out please let us know so we can adjust post. I have been putting this project off for a while because I hadn't yet found the perfect shade of paint for my project. 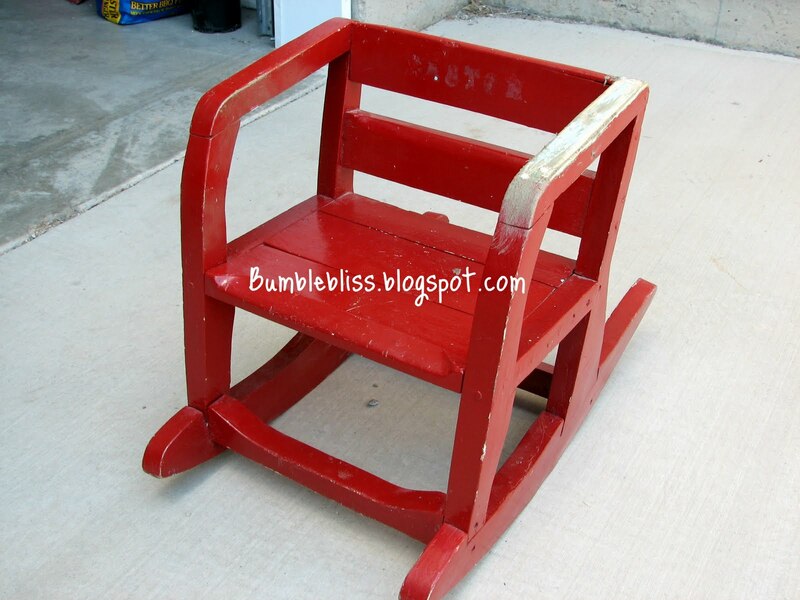 I found a cute rocking chair for my Little One at a yard sale and brought it home. He loves it so I decided to fix it up for him. The paint was peeling and had been painted over instead of repaired so I stripped it. That took a whopping 6 hours and considering the size of the chair and the lack of detail in the wood, I would have thought that it would take much less. Who knew. 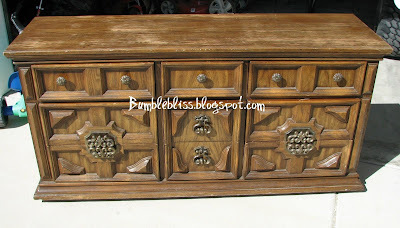 So after stripping the paint, hacking the screws in half, and questioning my sanity, I sanded this little baby, put it back together and filled in the holes with wood putty and sanded again. I primed it, and let it sit for about a month while I decided what color to paint it. Since I am new to this and I don't have a paint gun, I am limited to spray paint that I can find at HD, L's, and W's. 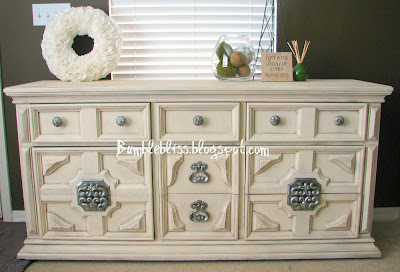 Up til now I have used Zinsser Primer, Valspar paint, and Rustoleum paint. I have done pretty well with all those and have been mostly satisfied but this time I opted for a color by Krylon. 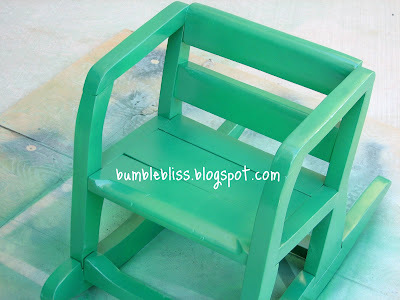 I used Krylon gloss in Emerald Green. I love this color. Though, I don't know if I love the paint. I have read many good things about this paint but I found it to be weak as far as coverage goes. 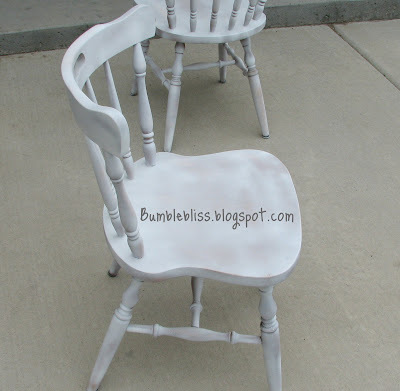 When I painted my chairs I used Valspar and one can of paint covered one full-sized chair with lots of detail with two coats and then some. It took me two cans of paint to paint this child sized rocking chair with no real detail. After I had painted it, I went to HD for something and found a very similar color by Rustoleum. I guess you could say I have buyer's remorse. C'est la vie. It is a beautiful color, don't you think? As I am new to the spray painting game, I have found that different brands of paint require differing amounts of pressure to work their spray paint cans. That being said, I have used three brands of spray paint. One primer, and two regular paint. My first project with spray paint I did by hand. It was small so it wasn't terrible but still, after awhile I kicked myself in the pants for not buying a spray can handle. 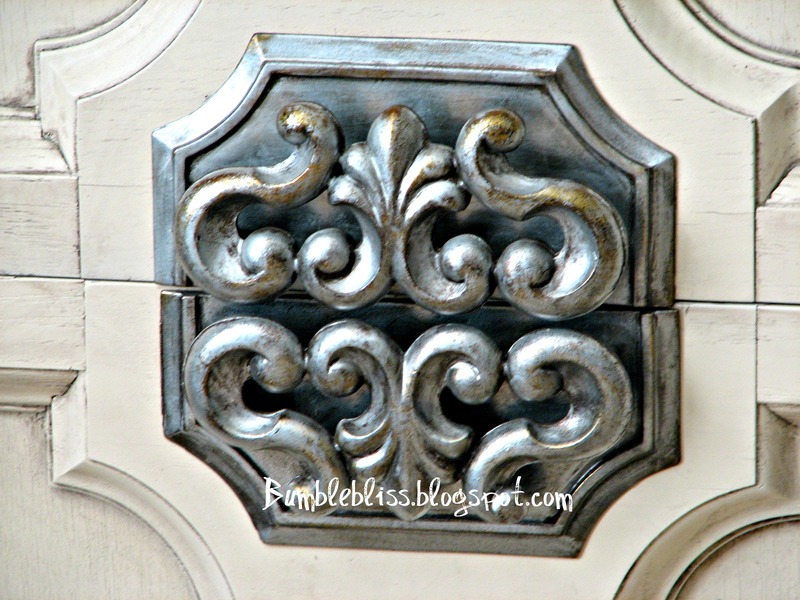 I only glanced at it while at the store buying paint so for my next project I sprung for this little gem. The packaging says you can put it on any spray can including things like bug spray but I hope never to need that much bug spray that I need one of these. I used it with my primer and paint cans. The one I bought had a clamp that you just squeeze and it opens like a clothes pin making it easy to place on the paint can. I found it to be very helpful during my painting process and I think it even made my painting more even so I didn't end up with splotches. The one thing to know about this is that after I used it I had a mysterious blister on my middle finger. After using the handle the next day, I found out that the blister was caused by the handle. 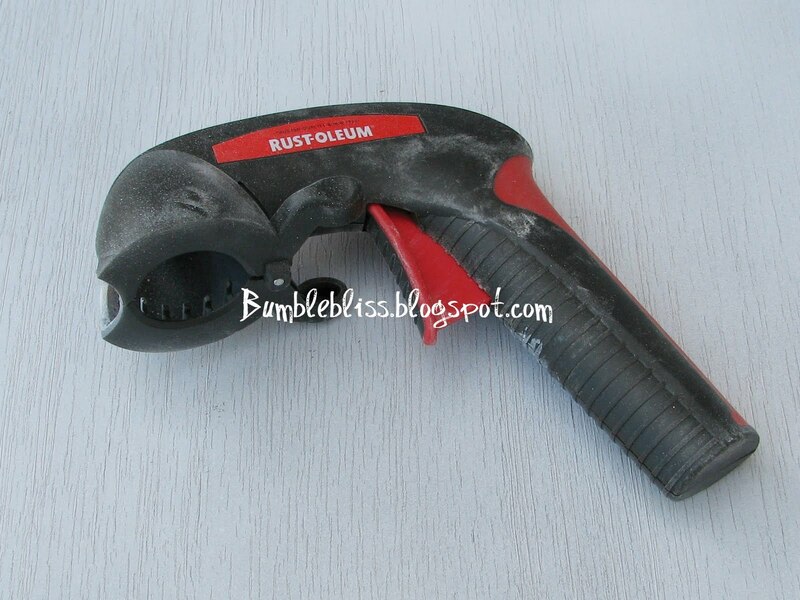 I think that if Rustoleum made the grip "softer" by adding a rubber grip cover or something like that it would eliminate this problem. My neighbor, who works with wood, says that he has experienced blistering also even with a more rounded grip handle. But in the end, all blisters aside, I would still purchase this and I will use this again. Were I to recommend it to a friend, it would be with the caveat that it caused me blisters. Disclaimer: I have not been compensated for this review in any way and the opinions expressed are wholly my own. 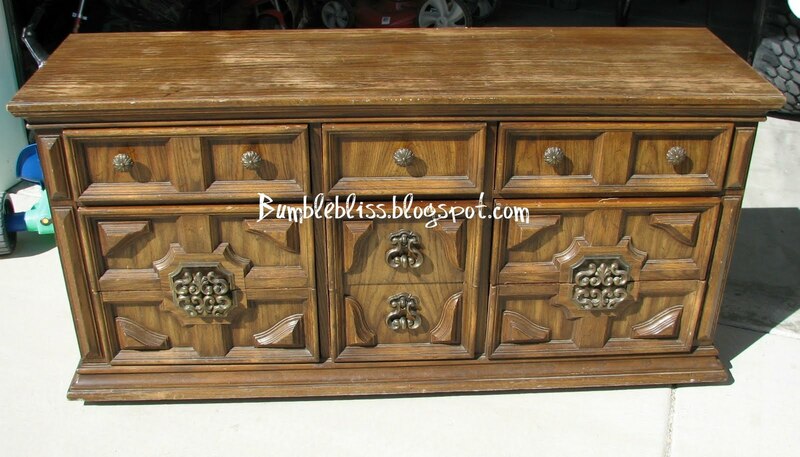 You know when you see something tasty and you think to yourself, "I'm full, but that looks good so I'm going to eat it anyway" and then you hate yourself afterward for eating it...well, that's me with this refinishing business. I get an idea in my head and think, "that'll be easy" and sometimes it's not. Well this time it wasn't. I have a sweet neighbor who was getting married soon and I asked her family what she would like or need. Her aunt told me she was in need of some dining chairs. I thought, "that can't be that hard to do." So I did it. First, in my usual style, I procrastinated and did a project that wasn't necessary but I wanted to do first and that took longer than I had anticipated, but that's another story in itself. Anyway, we decided on black chairs but I really wanted to try a two-toned look. Not something obvious, just very subtle. So I decided on trying to do some red-black chairs. I think it turned out pretty well. What do you think? I found these cute chairs on KSL and sanded and primed them. 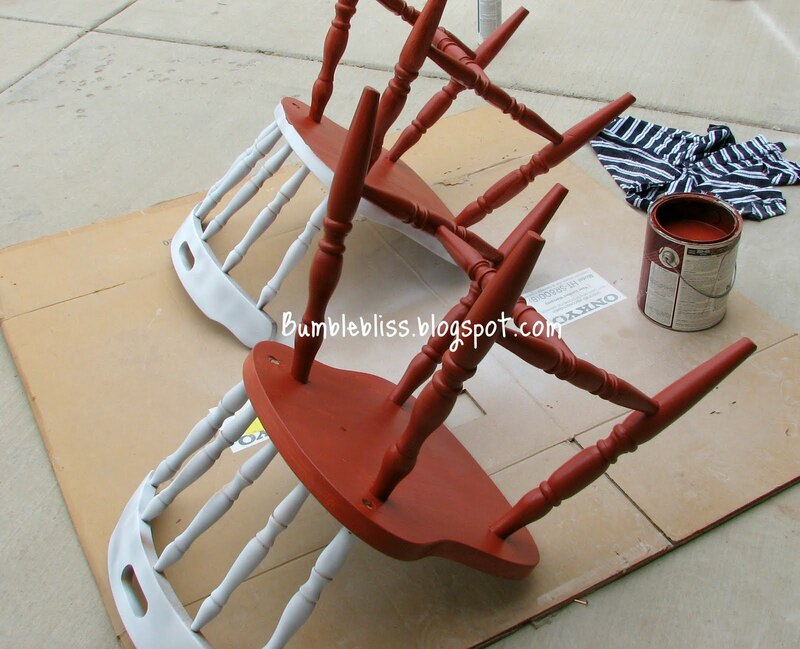 But then, to get the two-toned color I painted the chairs red. I got some awesome red paint for free so in the interest of saving money, decided to paint the chairs with a brush because I don't own a paint sprayer. Not my best idea. 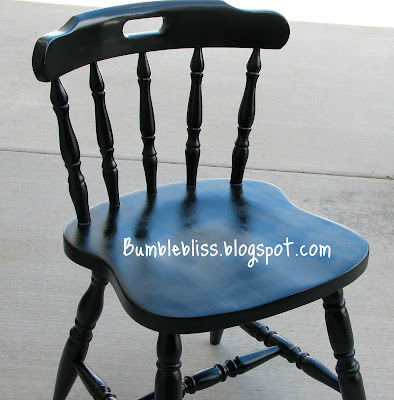 If you don't like the "country" look and by that I mean trees and rustic wood not twang and spurs, then I don't recommend using a paint brush especially on chairs. As there were so many nooks and crannies, it made it difficult to paint with a brush. I have to hand it to all the old time artisans who only did it by hand. After I painted the chairs red, I sanded them again to try and get rid of my brush strokes. I may be wrong and just used a junky paintbrush but I seem to recall buying a nice one. Who knows, maybe you've had better luck with your brushes. Next I painted the chairs black leaving some of the red showing through. I tried sanding but I went straight to primer when I did that so I found that if I just lightly painted certain areas it left the base color showing through just where I wanted it. 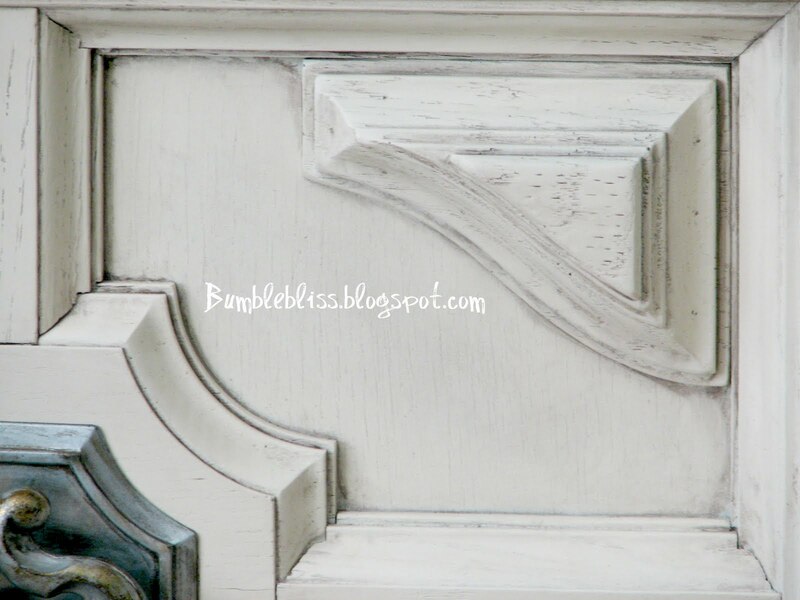 After all my painting was done I researched how to apply polyurethane. I also researched polyacrylic but for some reason I chose polyurethane. I don't remember why. I round lots of websites explaining how to apply it and what the best way to apply it was and I kept reading that foam brushes were the best and cheapest way to apply it. So that is what I opted for. I read some forums for people finishing surf boards and I thought, "surely these people know what they are talking about." 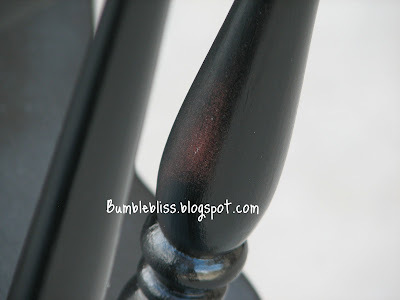 Well, I bought the cheap $0.99 foam craft brushes and tried them out on my chairs. I applied very thin layers of poly to assure that I wouldn't have bubbling, I did it in straight, even strokes in the same direction to avoid any weird bumps. I took my time and tried to do everything right applying I think four coats of the poly whilst waiting my recommended time in between. For all my hard work and following directions, I got streaks. STREAKS! It was awful! Well, it was to me. I'm hoping it ends up being one of those things where it looks bad to me because I am the one making it and no one else will even notice, but I'm sure with my luck...it won't be. Next time, I'm buying a gun. Let me know what you think. I'd love to hear from you. Lisa!!! Congratulations, Lisa you have won 100 Boxtops for Education for your school and highlights of our blog for you. You should have received an email with contact information and instructions on what you need to do.You must contact Bumblebliss via email at bumble_bliss@yahoo.com within 48 hrs or by 10:00 pm MDT on August 10, 2011 to claim your prize. We had a tie for the winner of a $50 Walmart gift card courtesy of Bumblebliss.blogspot.com so they will each receive a $25 gift card to Walmart to be fair. Congratulations to Jamie and Stacie! You should be receiving an email with instructions on what to do. Thank you all for entering our drawing and checking out our site. Please come back often for more tips, tricks, recipes, and giveaways! It begins today! Now is the time to comment to THIS post, follow our blog and like us on FB for your chance to win our first prize, highlights from our blog such as Hair Flowers, a baby gift box, Boxtops for Education for your school, and more. Tell your friends and make them like, follow, and comment for your chance to win our referral prize of a $50 gift card to Walmart courtesy of Bumblebliss. Just like us on Facebook and follow our blog. Comment to us that you did on THIS post and you will get two entries for the first prize. For every person you recommend that does the same and tells us so in their comments, you will get additional entries for the second prize of the gift card.. We have outlined the rules more fully on this post so if you're confused, check it out. With school starting up again it reminds me of all the lunches I have packed in the past. I'm not a huge fan of the lunches the school provided. I'm not saying its bad but I can pack better things and get more nutrition for my buck. Food is fuel for growing bodies and brains. I want to know what my kids were eating. They brought home the cute little bags and I could see what was left over. I knew if they only had cookies that day if there was still the rest left in there. Sandwiches were not always a big hit but we found little ideas to get around that. Here were some of our favorites. * Cracker Stacker's- We packed wheat crackers in a bag, cheese cut into pieces the size of the cracker, and most of the time lunch meat also cut the size of the crackers. Like a lunchable but half the cost and whole grain crackers. Kiddlets liked the novelty of it and it wasn't PB&J so it was a hit. * Lunch Logs- I know cheesy names but I have young kids and if I called it a lunch log it would be eaten. If I called it lunch meat and fat free cream cheese wrapped in a whole grain tortilla it might not have been. Its that simple too. Spread the FF cream cheese and lay out some meat. Roll it up and wrap it in foil or plastic wrap. Oh and depending on the size of the lunch box cut it in to pieces to get it all to fit. * Trail Mix- We like our nuts here and we love our fruit. We make a trail mix out of fruit that has been dehydrated and left as plain as possible and nuts, not honey roasted or lightly salted, just plain nuts. We would mix in a variety of nuts and fruits and call it good. * Vegis and Hummus- Yes I have kids that will eat hummus, but only if its the roasted garlic flavors. Mmm I can taste it now. It isn't something I can pack often but it gets eaten and I feel pretty good about it. * Apple wedges and peanut butter- My Son started to sit at the peanut free table so these had to stop but it was so simple on me, I missed it. Cut up an apple and bag it. Pack up some peanut butter and toss it in. I added a bag of pretzel's to get the rest out but they loved it. * Ants on a log- Celery that we filled with peanut butter and then topped with raisins. Simple easy and kids loved em. *Leftovers- If we had chicken the night before then they could see again the next day. As long as I can keep it cold and safe. I'm a big fan of being ahead of the game. I have three bins in my home for lunches, two in the pantry and one in the fridge. I keep one full of salty treats and one sweet treats both packed to about 100 calories give or take a few. In the fridge I have bags full of carrots and celery that I have prewashed and cut up. They last a few weeks like that so I cut two weeks at a time. When I pack lunches I grab a salty, a sweet, a vegi and a main item. For the Hubbs I pack him an extra snack and a fruit. Something simple and long lasting a bag of almonds, a protein bar, a string cheese or a nut bar gets him over that gap in between breakfast and lunch. Today he even got some diced up chicken in a cute pink Hello Kitty container. I guess we need to buy more lunch sized containers. Though we don't go to school anymore and have opted to have school at home we still pack a lot of picnics and have treats on hand. We pack lunches and go to historical sites then have lunch on a towel ofter to talk about it. Its much cheaper then a stop by a fast food restaurant and better for us too. We love to try out new things and would love to do a product review for you. If you are interested in us doing a review for you please email us and let us know. Everybody loves new friends and this is your chance to make some. Check out these blogs and follow them and they'll follow you back so we can all be friends. BumbleBliss is a great place to get tips and tricks to everyday living. Recipes, gardening tips, how-to's, reviews, and much more can be found on our blog. Feel free to share with us as we, and others have shared ideas to make life blissful, one moment at a time. 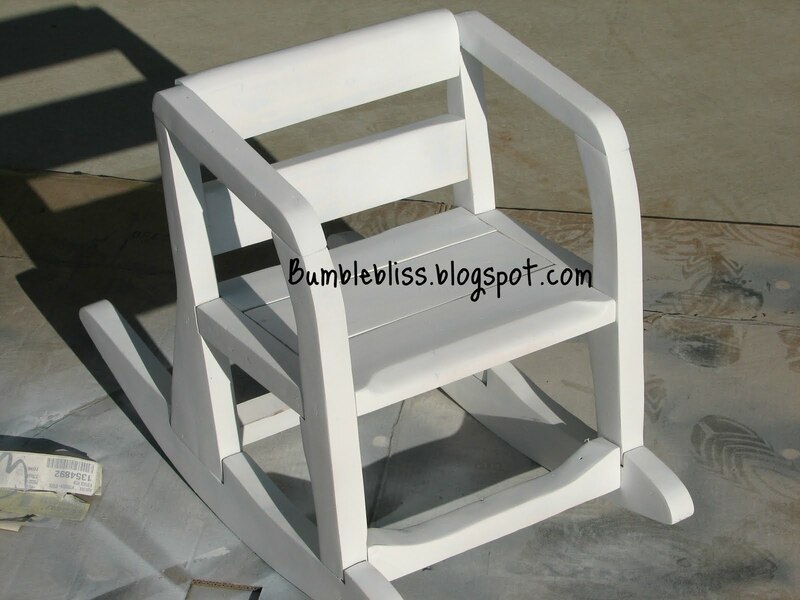 We at BumbleBliss have taken every effort to ensure that proper credit is given where it is due. Please extend the same courtesy to us. Link back to us, tell your friends, share the love! 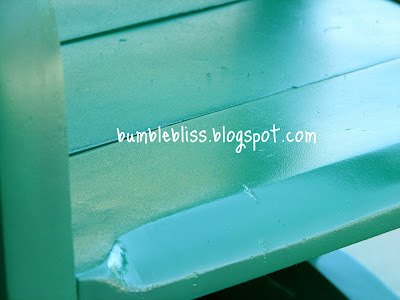 *No portion of this blog may be used without permission. Items made from the content on this blog may not be sold nor the tutorials used for profit. *Please do not re-post pictures of our kids. We are two best friends helping each other out and sharing secrets like we always have.